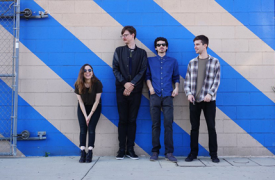 New Media is an indie-rock four piece consisting of Zach Noel, Jack Meighan, Tamara Simons, and Julien Nicolai. Their sound incorporates the melodic noise and fuzz of the classic indie and alternative era such as Pixies, Dinosaur Jr, The Replacements, and Fugazi; the exploratory guitar interplay of bands such as Sonic Youth, Radiohead, Wilco, and Built to Spill; the atmospheric, psychedelic folk-rock of newer acts like Kurt Vile and The War on Drugs, and the angular pulse of the 2000's post-punk revival to hold it all together. Basically, what you'd find in a record collection spanning more than four decades of modern indie and alternative rock belonging to four voraciously music-obsessed millennials. Gold Shimmer is an independent LA based electro-psych art rock band. It is a surrealist collaboration led by songwriter Jeff Venter on vocals alongside Artyone Turner on synth and Mitchell Manburg on lead guitar. Influenced by the Gorillaz, Young the Giant, and the Moon Duo they can rock, groove, get weird, and vibe out. Diven by a curiosity of music's limitations, nontraditional narrative, and theatrics the trio takes the audience for a ride through another time and dimension. 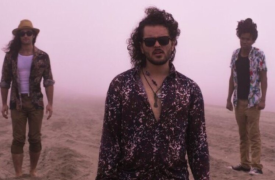 Euphio is a three piece jazz rock group from Los Angeles, California comprised of Lilliana Villines, Aidan McDonough, and Sean Tavella. 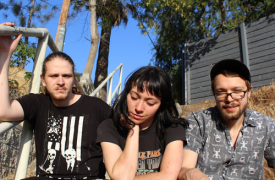 They released their EP Cartoon Problems in January 2018 and are playing shows in LA as well as working on an upcoming album. From the About page: Habitat is a band which formed in 2011 in Riverside, California, United States. 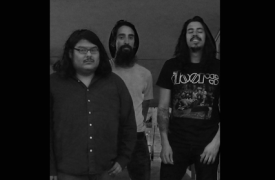 The band consists of Ivan Alcon (vocals,guitar), John De La Cruz (vocals, guitar), David Jauregui (drums), and Dan Jauregui (bass). Just four guys in the middle of nowhere. Practicing late hours of the night. Making noise.